Does this sound like you? If so, check out the following, as they are questions that have arisen with regards to Monarchs. 1. I found this long string thing hanging from my Monarch’s chrysalis. What is it? The string thing indicates that your Monarch caterpillar was a victim of a Tachinid Fly! If you wait long enough, soon you will probably see a puparium that will look like a brownish bean descend from the pupa. Your poor butterfly is dead. I’d squish the heck out of that brown thing or else you will end up with lots of those nasty flies just waiting to lay eggs on unsuspecting Monarch larva in your garden! Visit the post about Tachinid Flies. 2. My Monarch caterpillar isn’t moving. It stopped moving for a long time! I put it back on a leaf but it just won’t eat. Is it dead? Did I do something wrong? Your caterpillar is probably getting ready to molt. Leave it alone! It needs time to shed its skin. Visit the post about molting. 3. I had all these Monarch caterpillars on my Milkweed outside but when I went to look again, they are all gone! What happened? I can’t find them. Now, if your caterpillar is small (as in an early instar) there are several possibilities and they are not as happy. A spider could have taken off with it and eaten it for its lunch (and the Daring or Bold Jumping Spider is notorious for this! 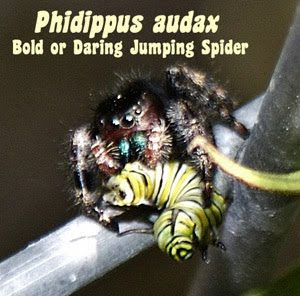 Gardeners must be very careful with this particular species; the Phiddipus audax has a nasty bite! ), it could have contracted a virus or bacteria and died, it could have been eaten by a lizard, …Let's just hope that the caterpillar was in the late instar and was on its way to continue its metamorphosis into becoming a butterfly. 4. Should I keep my Monarch caterpillars sprayed with water? I read that they should be in a moist environment and that I should keep a wet paper towel under them. NO! Absolutely not! Moisture + heat will breed all sorts of nasties (think mold, bacteria,…you get the picture!). Monarchs especially, are prone to all kinds of problems with molds and bacterial infections. Adding a moist environment to the mix will compound a potential problem. Keep their living environment dry. Make sure their leaves are dry, too! Only feed dry, healthy, FRESH food each day and make sure you remove all old food. If you spot any mold or decay, remove it immediately. Visit Raising Monarchs for more info. 5. Are Monarchs carnivorous or cannibalistic? Will they eat one another? Although Monarchs are not truly carnivorous they will eat one another on occasion in the larval stage! (EEEW! Yes, it is true!) More than likely, it is an accident, though, and a larger caterpillar will eat a smaller one because the little guy is on the leaf the big guy just so happens to be eating! It’s a case of being in the wrong place at the wrong time. The same thing can occur with eggs hatching at different times and a new hatchling eating an egg! Try to separate larvae by instar (by size) and you shouldn’t have a problem. 6. My Monarch caterpillars keep dying! I am so good about sterilizing everything. What’s wrong? Am I a bad Monarch mom? No, don’t be so hard on yourself. Keep in mind that the VAST majority of eggs laid do NOT make it to adulthood. If even 10% of the eggs one mama Monarch lays makes it to the adult butterfly stage, then that is REALLY outstanding! Predation, illness, parasitoids, parasites, and other causes are often the cause of death. Many larvae die in the very early instars. Just be diligent in your cleanliness in rearing these butterflies and you should be okay. Don’t give up. 7. One of my Monarch chrysalides fell! Is it dead? Do you see any green liquid? If the answer is yes, then unfortunately, your butterfly is dead. If no liquid came out then your butterfly is probably okay. You can carefully make a cushion of a few folded tissues sheets (like a little soft bed) and place the chrysalis on top. Make sure that when the butterfly ecloses, there is something nearby for it to climb up (is there a netting or a stick?). The butterfly will need to be able to climb UP to stretch and dry its wings. It is NOT necessary to glue or tie the cremaster (the little black thing at the top of the pupa) onto something. Butterflies are pretty resilient as long as they have some way to climb up. 8. My caterpillar is throwing up. Is this normal? Monarchs should not throw up. If the ‘vomit’ is green, it can be a few things. The food you are giving it could be poisoned (perhaps it was treated with a systemic insecticide). The caterpillar could be stressed out (did you have it out in the heat then brought it into an air conditioned room?). It could also have an infection. Remove the caterpillar from any other caterpillar it may have contact with, to be on the safe side. Just like humans, if it is sick, it can spread the illness to the others! Keep an eye on it. Monarchs should NOT throw up or regurgitate. Usually, this is a bad sign. 9. How do I euthanize a butterfly or caterpillar? There are several ways to euthanize a sick butterfly or caterpillar. It depends upon what you feel most comfortable doing. Personally, I prefer the freezing method. Place the insect into a baggy, seal the baggy, then place it into the freezer overnight. Then, you can dispose of the baggy. The freezing temperatures will slow down the insect’s body functions. 10. How long does a Monarch live? Butterflies do not have very long lives. Most live for about two weeks. 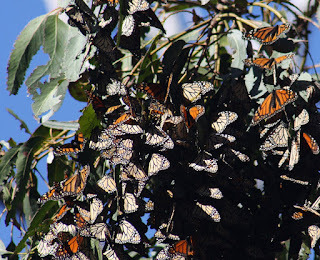 Monarchs can live longer, if they are going to overwinter. (BTW, those that overwinter in Mexico or along the coast of California are NOT always the same ones that started their journey! It takes five generations to complete the entire cycle). Monarchs that overwinter have a longer lifespan than others. Monarchs overwinter as butterflies (not pupa or larva or ova/egg). All pictures and content on MyMonarchGuide are the copyright of tdogmom/MonarchFriend. Permission is granted for personal and educational use only. ...click on a topic that interests you. Is my Monarch a boy or a girl butterfly? What does a Monarch caterpillar look like? What instar is my Monarch caterpillar? I found a Monarch egg! Now what? Is it possible to gender ID a pupa/chrysalis? Can I touch caterpillars & butterflies? CAUTION! Milkweed can be DANGEROUS! How do I plant Milkweed seeds? My Milkweed Leaves look strange…what's wrong with them? Why should I be concerned about Oe? What do I need to raise Monarchs? What supplies do I need for raising Monarchs? the Red and Black bug: Is it a Milkweed Bug? looks like a bee? Is it a Hover Fly or Syrphid? I am NOT a Monarch expert—just an enthusiast who wants to help spread the word about these magnificent creatures' decline due to what humans are doing... So, if you do find any glaring errors, let me know. If you have questions or just want to drop me a line, that's fine, too.